About 30 minutes from the Golden Gate Bridge, Comforts Cafe radiates with activity where everyday seems like rush hour. In the quaint and cozy town of San Anselmo, Glenn, the papa, Laura, the momma, and Erin, the daughter, have been serving up their home style cooking to their loyal, local following since 1986. Just about any day or time is a feeding frenzy at the Miwa Family’s owned and operated cafe. Nearly 30 years ago, Glen was working in Los Angeles in the Advertising field, he explained, “I felt that it was financially rewarding but spiritually empty”. Glenn wanted to take his creative juices and develop a restaurant fusing different cultures of food with a focus on locally sourced ingredients. Glenn is of Japanese descent and his partner was Brazilian, so the idea of merging Latin food with Asian was both intriguing and a complete novelty in the 1980s. With the encouragement and push from his mother-in-law, the Miwas traded their fast-paced urban life and began their search for a quieter environment with their young daughter, Erin. Upon driving through Marin County, they fell in love with the enchanting town of San Anselmo and the surrounding community. From opening day, Comforts Cafe was a rousing success. Back in their early days, the focal point for the cafe was breakfast because that is Glenn’s favorite meal. The division of labor in the family began with Glenn taking charge of the kitchen, Laura overseeing the cafe and office, and their eager 7 year old, Erin, spending her afternoons cleaning the bathrooms, doing the dishes, and preparing the desserts. At 10 years old, Erin was promoted to dressing salads and had to stand on a milk crate to fulfill her task. In high school, Erin was promoted to working behind the counter and had to overcame her nervousness of engaging with customers directly. Before the term “fast casual restaurant” was coined as a dining category, Glenn and Laura Miwa took this concept and began making meals to this underserved community. Looking and waiting for homegrown, everyday food, this family nurtured a strong bond with their customers dining in, on-the-go, take-out, and for party gatherings. Comforts Cafe is truly a one stop food destination for a sit down breakfast or lunch, pre-wrapped lunches or dinners, and it has a full-blown bakery with fresh pastries, mouth-watering desserts, and a full-service catering business. 30 years ago, Glenn and Laura had to drive 30-40 minutes to San Francisco for home-style Japanese food and spices, but now farmers come to them with the freshest of produce. What used to be innovative type of food 30 years ago still holds true today, and on a Saturday in the summertime, Comforts will sell up to 500 of their signature Chinese Chicken Salad. One day a year the cafe closes for a thorough cleaning. The Miwas shared a funny story about how a customer started banging on the door desperately. He said that his wife was in the hospital about to give birth and had to have their Chinese Chicken Salad. Comforts Cafe also hosts quite a range of breakfast items, like donut muffins, pecan french toast stuffed with cream cheese, and muffin tops. Besides their popular Chinese Chicken Salad, customers have a wide array of lunch choices, such as: enchiladas, flank steak, and chicken pot pies. Finishing off their menu are desserts like, coconut cream cake, tarts, cupcakes, and cookies. Erin is no longer reluctant or shy about engaging with customers. She has and will become the face of Comforts when her parents retire in 5 years. Although “retirement” to Glenn means taking a less active role in running the kitchen, he is turning his “Comforts” into a cookbook with the hopes of sharing his secret recipes with his communal family. 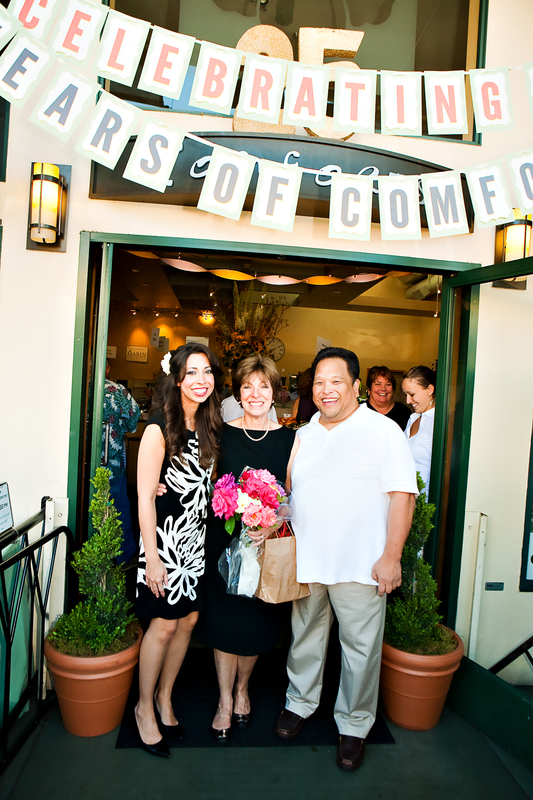 Comforts’ recipe for success is all in the Family. Watch the Video Story HERE.